About 31 million Americans suffer from back pain at some point. It's the second most common reason for going to the doctor. While most people with back pain have a sprain, ruptured disk or irritated joint, others suffer from chronic conditions such as inflammatory arthritis or a degenerative disease. Inactivity won't help back pain. The University of Michigan Health System suggests staying active and doing common exercises, such as riding a bike. A stationary bike provides a no-impact workout, meaning that there's no force on your joints or spine while riding. An upright bike is designed like an ordinary road bike. You ride while sitting in an upright position or leaning forward like a racer. On an upright stationary bike, you can work sore muscles in different areas by shifting position. Recumbent exercise bikes position the rider's body in a reclined pose. Because the backrest provides lower back support, depending on the nature of your condition, this type of exercise bike may be more comfortable than using an upright bike. Spinal stenosis is a common condition for men and women over the age of 50 in which the spine narrows and places pressure on the spinal cord and nerves. Symptoms include pain, numbness, weakness and cramping in the back and extremities. One of the non-surgical treatments for the condition is exercise. Osteoarthritis is a degenerative joint disease caused when the cushioning tissues between bones break down. Fitness expert Megan Tyner suggests that using an upright bike is the best type of stationary bike for people suffering with spinal stenosis or osteoarthritis. An upright bike may provide the most comfort because it allows you to lean forward while riding. Degenerative disc disease is a painful back condition caused when spinal discs become damaged by age or injury. Discs act like shock absorbers for the spinal bones. They keep the back flexible and protect nerves. Acute pain associated with this condition makes normal mobility extremely difficult and the bones can become unstable. A recumbent bike may be the best type of stationary bike for this painful back condition because it provides lower back support. The best stationary bike for your condition comes down to the bike that you feel most comfortable on. The American College of Sports Medicine states that position is important. 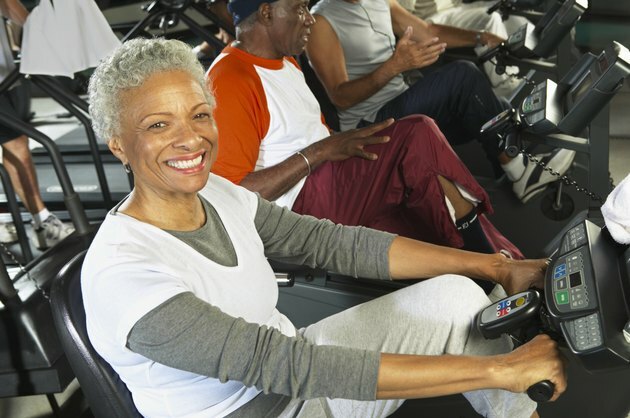 If your back pain is coupled with mobility or balance problems, a recumbent bike may be your best option because you can sit in a reclined position or raise the seat so that it is semi-recumbent. Both positions take pressure off your back. Spine-Health suggests choosing a bike with an easily adjustable seat that is positioned at hip height. National Institute of Arthritis and Musculoskeletal and Skin Diseases: What is Spinal Stenosis?